It’s been a bittersweet spring for Missoula Merc enthusiasts. As quickly as the city decided to move forward with the historic downtown building’s deconstruction, the bricks and lumber started coming down. Now, less than a month later, it’s mostly gone – a half-block sized hole that will, perhaps just as quickly, be filled in with a new 150-room hotel. But there is some salvageable hope: Like the peace sign that once graced the north hills of Missoula, the merc won’t ever really go away. It will never resume the form it had for more than a century – but it’s legacy will live on in parts – bricks, timber, beams and memories in the homes, businesses and lives of those who find semblances of nostalgia and joy in holding on to a piece of what once was. And truth be told, we’ll be among those who swing downtown Sunday afternoon to pick up a piece of the old building’s brick exterior. And we tried to steal spaces from its tiny, tiny parking lot in back on days we were late to downtown appointments. 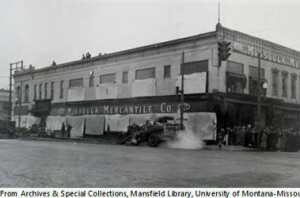 But our greatest memory of the Missoula Mercantile was as a resting place, a free meeting space during our teenage years. In between the first and second floor, halfway up a tiny staircase in the middle of the building, was what we assume was previously the employee break room – a tiny little space with a table, a few chairs, a rotary phone and, most important, an inkling of privacy. Before we drove cars, before cell phones were even a thing, this was where Missoula teens – at least the ones of our generation – whiled our free time made our strangest memories. Nothing to do but sit on the chairs, gossip and flirt. Make a few prank calls. Come, go, stay awhile – if there there wasn’t already someone there, you could bet there would be soon enough. So we’ll grab a piece of the old Merc on Sunday, but not because we particularly cared about the building or its place in Missoula history. But because it’s a piece of our childhood – the part before phones, cars, meetings and plans, families, history and baggage. A part we took for granted at the time. We may never get that back, that’s for sure. But it’s not entirely gone. It, too, lives on in parts – bricks, timber, beams and memories in the homes, businesses and lives of those who find semblances of nostalgia and joy in holding on to a piece of what once was. If you’d like to snag a brick from the former Missoula Mercantile, the free giveaway is slated for 1-5 pm in front of the Firestone Building downtown. That’s at the corner of East Main and North Pattee, just a block east of Higgins. Big Dipper will be serving ice cream to the first 1,000 people who stop by, and the giveaway will last until the bricks are gone.